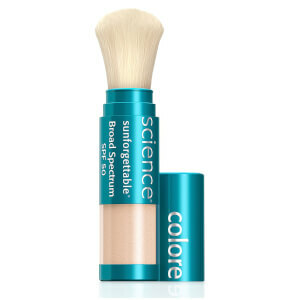 Ensure total environmental protection from harmful UVA/UVB, pollution, blue light, and infrared radiation with the Sunforgettable Total Protection Duo Kit from health-forward, mineral cosmetics label, Colorescience. Combining a liquid face-shielding formula with a powdered version (both offering broad spectrum SPF 50+) the duo arms you with a 90-day supply of total defense against factors that cause premature ageing and skin damage. Free from parabens, sulphates, phthalates, oils and fragrance. An antioxidant-packed facial sunscreen with a weightless liquid texture that blends invisibly into all skin tones and deeply hydrates the complexion. 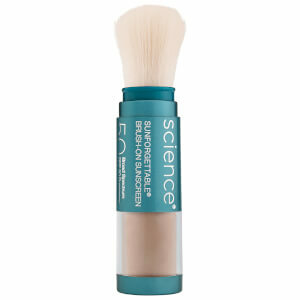 Recommended by the Skin Cancer Foundation, the water and sweat-resistant formula is powered by the brand’s exclusive, barrier-forming EnviroScreen™ Technology, which combines Lipochroman®, Infraguard and mineral oxides to counteract aggressors including UVA/UVB, pollution, blue light and infrared radiation. Offering unmatched broad spectrum protection, the multi-action formula is enriched with Phytomoist for intense hydration and calming agents that soothe redness and irritation. A water and sweat-resistant sunscreen powder that offers broad spectrum defense against UVA/UVB rays, alongside other external aggressors including pollution, blue light and infrared radiation. 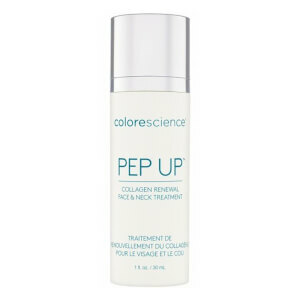 Powered by the brand’s exclusive, barrier-forming EnviroScreen™ Technology, the all-mineral, antioxidant-packed powder utilizes Sodium Hyaluronate (powder form of Hyaluronic Acid) to restore and reinforce moisture in the skin. Arriving in a convenient, portable, fuss-free tube topped with a soft brush made up of antimicrobial bristles, the protective powder offers four different shades that deliver a hint of sheer coverage without chalky residue. Face Shield: Zinc Oxide 12%, Water, Butyloctyl Salicylate, C12-15 Alkyl Benzoate, Isododecane, Lauryl PEG-8 Dimethicone, Dimethicone/Vinyl Dimethicone Crosspolymer, Propanediol, Dimethicone, Niacinamide, Caprylyl Methicone, Dimethiconol/Propylsilsesquioxane/Silicate Crosspolymer, Trilaureth-4 Phosphate, Allantoin, Tremella Fuciformis Sporocarp Extract, Bisabolol, Disodium Lauriminodipropionate Tocopheryl Phosphates, Caesalpinia Spinosa Fruit Pod Extract, Helianthus Annuus (Sunflower) Sprout Extract, Glycerin, Tocopherol, Lauryl PEG-10 Tris(trimethylsiloxy)silylethyl Dimethicone, Maltodextrin, Sodium Chloride, Ethylhexylglycerin, Isoceteth-10, Silica, Betaine, Capryl Glycol, Dimethylmethoxy Chromanol, Hexylene Glycol, Tetrasodium Glutamate Diacetate, PEG-10, Dehydroacetic Acid, Phenoxyethanol, Potassium Sorbate, Benzoic Acid, Sodium Benzoate, Iron Oxides (CI 77491, CI 77492, CI 77499). Brush-On Sunscreen: Titanium Dioxide 22.5%; Zinc Oxide 22.5%, Mica, Dimethicone/Vinyl Dimethicone Crosspolymer, Dimethiconol/Propylsilsequioxane/Silicate Crosspolymer, Lycopodium Clavatum Extract, Sodium Hyaluronate, Imperata Cyclindrica Root Extract, Glycerin, Water, Caesalpinia Spinosa Fruit Pod Extract, Vitis Vinifera (Grape) Seed Extract, Camellia Sinensis Leaf Extract, Quercus Robur (Oak) Wood Extract, Helianthus Annuus (Sunflower) Sprout Extract, Maltodextrin, Methicone, Triethoxycaprylylsilane, Laureth-4, Sodium Benzoate, Potassium Sorbate, Chromium Oxide Greens (CI 77288), Iron Oxides (CI77491, CI 77492, CI 77499).